Practise full tenses, we recommend start practising Catalan verbs with regular verbs in present tense. 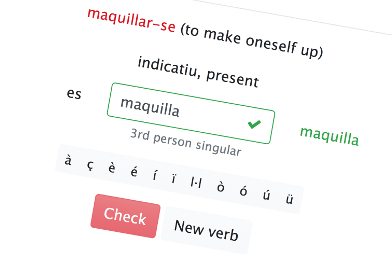 Later you can switch to irregular verbs in other tenses like past (imperfet or passat) or future (futur). Practise random forms, this exercise is for the more advanced. Practise random verbs in random tenses and random forms. This site provides mainly verbs and grammar, while the real learning happens through listening, speaking and breathing the Catalan culture. A nice way of learning for example is to listen to Catalan music.